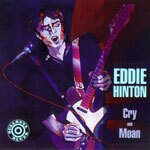 CD reviews: "Cry and Moan" and "Don't Let the Bossman Get You Down"
These reviews first appeared in the September/October 1991 issue of Living Blues magazine. Hinton's album, by virtue of his songwriting, is the more interesting. Bishop's is far and away the more listenable. Hinton probably comes closer to the blues; his music is generally a likable hybrid of raw roots rock and sophisticated Charles Brown-type R&B. Bishop's covers more ground, ranging from the familiar Southern boogie rock (a la the Atlanta Rhythm Section or Allman Brothers) through urban funk and approaching straight blues. As a guitarist, Hinton is technically gifted, with a touch of soul, and he plays with taste and restraint. One "Come on Home Baby Lee" and "Make it Easy on Me" his guitar setup sounds nearly identical to Robert Ward's Magnatone sound, and he uses a psychedelic, echoing effect on "The Well of Love." But elsewhere he has a more mainstream sound. His playing is shown in its best light on "Testify," backing his vocals with smart, sharp punctuation. The high point of Hinton's album is "Got to Have You," which combines perhaps the best song on the set with certainly the most jumping performance. The beat almost takes off, and Hinton's husky voice burns with intensity. But the overall impression one is likely to have from "Cry and Moan" is that of a collection of well-crafted, masterfully constructed American pop/folk tunes with a twist of blues, written as well as anyone has this side of Percy Mayfield. It seems certain that we will be hearing these songs again elsewhere, for Hinton's compositions are of that rare type that invite artistic interpretation without fear of losing their identity. Bishop, on the other hand, wrote but half the dozen songs on "Don't Let the Bossman Get You Down." This should hardly be construed as criticism, though, for Bishop's tight, mesmerizing performances make each songs his own. In fact, Bishop shines brightest when performing others' material. Gone is the dark, brooding blues of Bishop's early career (as on "Never Say Never" from the Butterfield band's "East-West" album). Fortunately, still intact from his Butterfield days is Bishop's incisive, imaginative guitar, as full of fresh licks and unbounded energy as the day he and Mike Bloomfield set the blues/rock world on its ear by trading solos on the 13-minute title track from "East-West." Another change from Bishop's early days, and a pleasant one, is that his vocals are vastly improved. The man who once hired future Jefferson Starship singer Mickey Thomas to front his band in the mid-'70s (scoring big with the Top 40 hit "Fooled Around and Fell in Love") now comfortably, and competently, serves as his vocalist. Of interest to blues fans is the guest appearance of guitarist Luther Tucker on "Just Your Fool." Unfortunately, Tucker doesn't do anything special with the song, perhaps not wanting to steal Bishop's spotlight. Bishop himself comes closest to the blues on the instrumental "Devil's Slide," and turns in some nifty slidework. He gets into some heavy funk on "Soul Food" and "Come on to This House," and changes gear into a boogie shuffle on "Rollin' With My Blues."